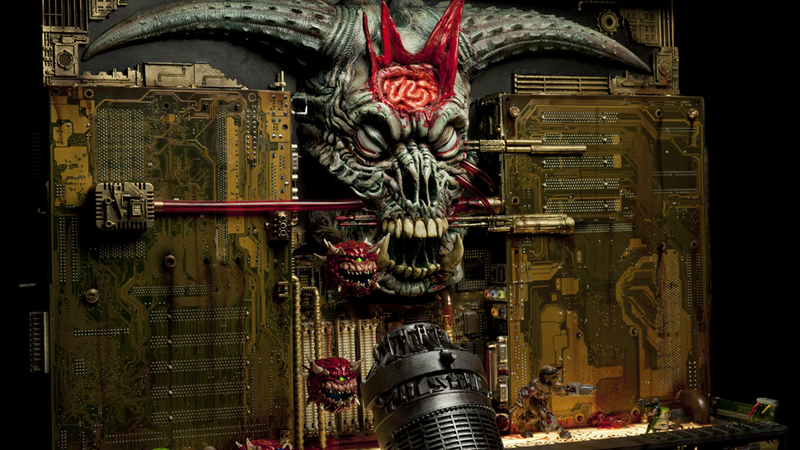 Made from found objects, old circuit boards and action figure parts, artist Jason Hite's miniature sculpture of Doom II's final level "The Icon of Sin" is just as incredible and iconic as the level itself. Over the years, I have collected circuit boards from computers and odd devices. The panel on the right of the demon's head was sitting in a cardboard box in the back of my YMCA getting rained on, before I "liberated" it. The guns are from the Quake action figures by ReSaurus Toys that came out back in 1998. At least they are accosted with Doom. I would have loved to make a BFG, and still might do so, but I ran out of time. I'm actually kind of surprised that no one has made one by now. The Doom Guy figure and zombie behind the Cyberdemon are slightly augmented from HorrorClix figures…and the dozen bullets are dummy .30 ammo that is epoxied them tightly into the piece. If you're in Santa Monica CA next week, you can see the sculpture in person at the Copro National Gallery, or even take it home for $6,000. Here are some pics of this beauty with Cacodemons, a Cyberdemon fighting Doom Guy, the giant final boss The Icon of Sin... and the true final boss inside, John Romero's head.